Protecting your eyesight is an important part of staying healthy overall. Maintaining sound eye health will also help you preserve your quality of life as you age. To keep your eyes as healthy as possible, follow these simple lifestyle practices. Get regular eye exams. Some eye problems — including age-related macular degeneration, diabetic eye disease and glaucoma — may not show any warning signs until they have progressed into their advanced stages, limiting the treatment options. However, by undergoing regular eye exams, your eye doctor can help detect eye problems in their early stages and suggest appropriate treatment options sooner. Learn your family eye health history. If other members of your family have been diagnosed with eye conditions, you may be more at risk of developing them. If you have a family history of eye disease, alert your eye doctor, so he or she can monitor your eye health. Eat a healthy diet. It’s not just carrots that are good for your eyes. A diet rich in fresh fruits and vegetables can help keep your eyes healthy. This includes dark, leafy greens, such as collard greens, kale and spinach. Fish high in omega-3 fatty acids may also help protect your eye health; these include halibut, salmon and tuna, among others. Maintain a healthy weight. 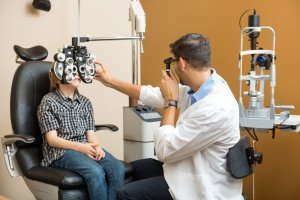 Being overweight or obese can increase your risk of certain eye conditions, such as diabetic eye disease and glaucoma. Eating a healthy diet and exercising regularly can help you lose weight and keep the weight off. If you still have trouble, talk to your doctor. Give up smoking. Smoking tobacco increases your risk of several eye conditions, including age-related macular degeneration, cataracts and damage to the optic nerve. If left untreated, these eye conditions can lead to blindness. Wear sunglasses. The ultraviolet rays in sunlight can damage, not only your skin, but also your eyes. To keep your eyes safe, wear sunglasses whenever you are outside. Make sure the glasses are certified to block 99 to 100 percent of both UV-A and UV-B radiation. Let your eyes rest regularly. If you read, use a computer or do close-up work for long periods, give your eyes frequent breaks using the 20-20-20 rule. Every 20 minutes, look at an object about 20 feet away for 20 seconds. Keep your contact lenses clean. If you wear contact lenses, be sure to follow their cleaning instructions closely. In addition, wash your hands thoroughly before you take out or put in your contact lenses. This will reduce your risk of developing an eye infection. Be eye safe at work. If your workplace requires protective eyewear, be sure to wear them at all times. In addition, know what to do if you, or one of your coworkers, has an eye injury or is splashed in the eyes with harsh chemicals.